The Glasgow Recycling and Renewable Energy Centre (GRREC) has commenced operations, boosting the city’s recycling rates and diverting 90% of all council waste from landfill. The project was initially due for commissioning in 2016 but ran into delays when Interserve issued a trading update and was later served a notice of termination. Doosan Babcock was announced as the new EPC contractor to complete the facility. The GRREC comprises of a materials recycling facility, an anaerobic digestion plant and an advanced conversion facility which produces refuse-derived fuel from post-recycled materials that remain. Wärtsilä Gas Solutions is supplying a liquefaction plant to the VEAS wastewater treatment plant in Slemmestad. The plant will allow VEAS to upgrade biogas to biomethane for use as a transport fuel. The project is scheduled to start commercial operations during 2020 and will produce biogas equivalent to approximately 6 million litres of diesel each year. Put the thing on wheels! Anyone travelling through Heathrow airport’s Terminal 5 can easily spot one of southern England’s largest waste-to-energy (WtE) plants, sitting just outside the airport’s boundary fence. This is the Lakeside Energy From Waste facility, a joint venture opened in 2010 by Grundon Waste Management and Viridor. The facility became fully operational in 2012 and can handle waste upwards of 1,400 tonnes per day, and generates 37 MW of electricity. But it might not be there for much longer, despite being less than a decade old. After much debate and disagreement, Heathrow looks set to begin work on a new runway in the next few years. Parliament gave its assent in 2018, although final planning approval is yet to be granted, and opposition remains powerful, not least from the current mayor of London. Proponents of the runway hope that work could begin as early as 2021. This would mean the closure and relocation of the Lakeside facility, as it lies in the way of the necessary expansion of the airport’s boundaries. This in itself is proving politically unpopular, with all the planning requirements and opposition efforts normally found with a brand new WtE site. In February 2019, the plant’s operators announced they have identified a new site for the plant, just 600 metres northwest of its current location. A public consultation on the relocation is currently underway. It probably doesn’t say much for the level of joined-up planning that a new waste facility could be built right on the edge of an airport facing huge pressures to expand. The government appeared to be caught unawares of the implications of a third runway, and initially suggested – unsuccessfully – that plans be drawn up that did not require the plant to be demolished. A timely reminder, perhaps, that the waste sector does not exist in a vacuum, and must compete with other sectors for land and monetary investment. Hence the likely expense of moving the entire plant less than half a mile up the road. In many ways, the story is indicative of London’s continuing struggle to modernise its waste management services. Until quite recently, London sent most of its waste to landfill outside its boundaries. This approach falls foul of two modern tenets of waste management; that waste should be dealt with in situ as much as possible, and that landfill should be minimised. But fragmented oversight – London has no single waste authority – and planning issues have led to a confused and complex picture. Lakeside’s principal customer is the West London Waste Authority. The WLWA now landfills very little (most former sites are now closed), instead sending everything it can to two WtE plants. 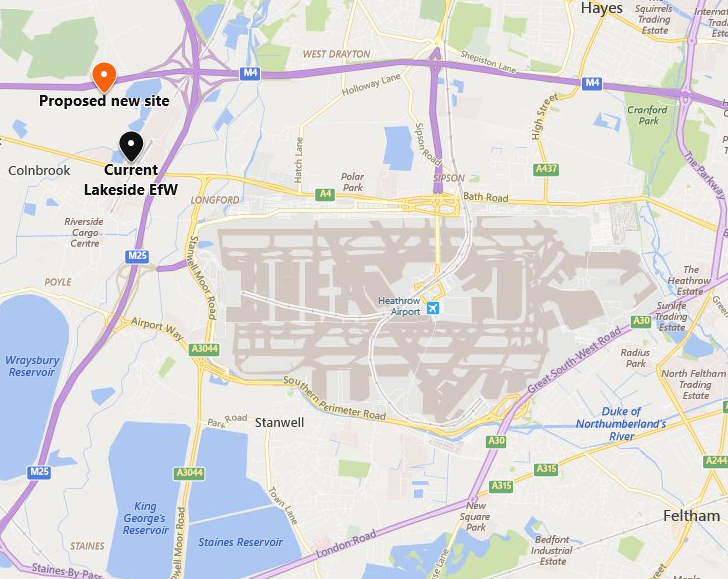 One of these is Lakeside, hence the urgent need to have its replacement ready once the Heathrow bulldozers move in. The other plant is the Suez-operated Severnside, which opened in 2016. This is a modern facility, but doesn’t have the capacity to absorb the waste processed at Lakeside (from the WLWA and other nearby local authorities), and has the added disadvantage of being nowhere near London. 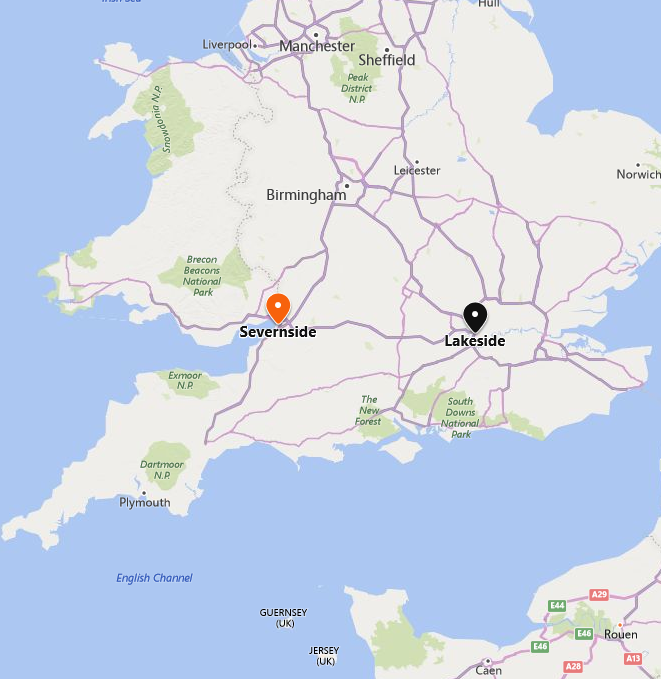 Waste from west London is currently transported by road over 100 miles to the Severnside plant. The Lakeside saga highlights London’s struggle to upgrade its waste management policies and infrastructure, faced with planning law, environmental/residential opposition, and a disjointed regulatory structure. West London is not alone; North London faces similar challenges with its ageing Edmonton plant. Life may have been simpler when Londoners could simply shove all their rubbish onto a barge and float it down the Thames to landfill far away in Essex, but those days are gone. 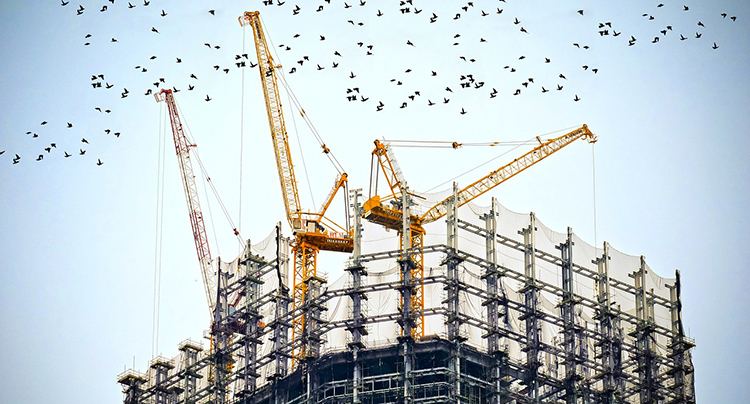 There are opportunities here, of course, for developers and operators of technology which will better allow a large and complex city to deal with its waste in a more efficient manner. The Greater Manchester Combined Authority (GMCA) has announced that following a year-long procurement process to secure new operating contracts for the Greater Manchester waste and resources management services, the preferred tenderer for both of the lots being awarded is SUEZ Recycling and Recovery UK Ltd. The contract is one of the largest of its kind in the UK, involving the handling of waste collected from approximately 1.2 million households. Lot 1 includes the operation of five residual waste facilities, nine Household Waste Recycling Centres, eight Transfer Loading Stations, the Bolton Thermal Recovery Facility, a Materials Recovery Facility, the obligation to produce refuse-derived fuel and associated rail transport and supply to the Runcorn Energy Recovery Facility. Lot 2 includes the operation of eleven standalone Household Waste Recycling Centres that are located on sites separate to the main waste treatment facilities. The decision was made to separate the contract into lots to generate a competitive market response. There will now be a mobilisation period so the current contractor; Viridor (Greater Manchester) Ltd can hand over the operation of all the facilities to SUEZ. The new contracts will commence on Saturday 1st June 2019. Existing staff working at the sites will transfer over to SUEZ. SUEZ beat off competition from Veolia for the contract, after Viridor withdrew from the procurement process, citing commercial reasons and its intention to focus on other market opportunities. A third lot, for biowaste services, was cancelled in October 2018, over uncertainty about the national resources and waste strategy. 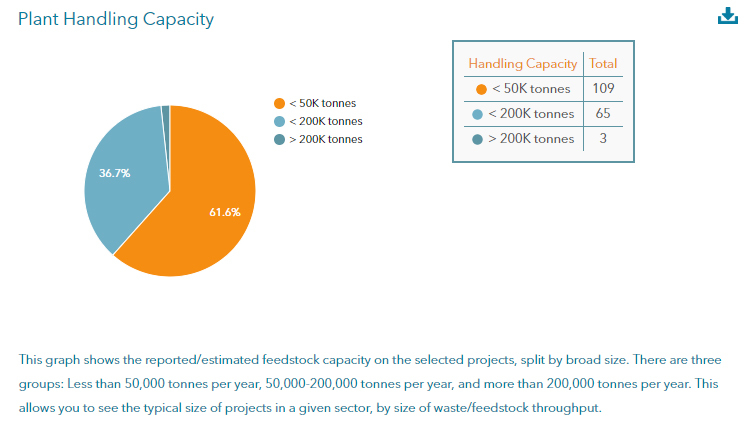 The GMCA is now looking to secure a contract for a framework of in-vessel composting (IVC) operators capable of receiving 125,000 tonnes per annum of household food and garden waste for treatment and recycling. The GMCA currently utilises IVCs at Bredbury Parkway (Stockport), Salford Road (Bolton) and Trafford Park (Trafford). On 8th March, construction officially began on the site of a new waste-to-energy (WtE) plant in Kwinana, Perth, which will be operated by Veolia. The facility will incorporate two full automated furnaces or lines and will recover energy from 400,000 tonnes of municipal, commercial and industrial waste each year. It will also recover recyclable materials that otherwise would have gone to landfill and convert residual ash into by-products such as bricks or road aggregate. See the full details of this project. The ECB Group has signed a memorandum of understanding with the Paraguayan government that will allow the company to continue its investment in the country. As part of the agreement, a new complex known as Omega Green will be developed to house the first second-generation renewable fuels plant in the Southern Hemisphere. The facility will produce renewable diesel and kerosene for civil and military aviation from feedstock such as soybean or cooking oil. Does New Zealand have a burning waste problem? One recent new investment proposal caught my eye. A new waste-to-energy plant is being mooted in New Zealand, at Huntly, just south of Auckland, the country’s largest city. Details are scant, although the project’s proposer (Whakaaro-Kingsman) seems to be looking to the new Copenhagen WtE plant, opened in 2017, for inspiration. New Zealand currently has no major WtE facilities, so the construction of such a plant would represent a significant change in waste policy. The country remains almost totally reliant on landfill, for which statistical collection is poor. The principal driver of change is environmental concerns over rising landfill levels. The recent Chinese ban on imports of waste also appears to be making New Zealanders take more notice of how their rubbish is dealt with. The past few years have seen better management and control of landfill, and efforts to introduce ‘circular economy’ approaches to waste management. In 2008, New Zealand passed the Waste Minimisation Act, which began to tax waste sent to landfill, as in Europe. Recent government policy has focussed on reducing landfill tonnage by recycling, and reduction of plastic waste in particular. Plastic shopping bags are due to be phased out in July 2019. The role of WtE in New Zealand’s waste policy looks dubious, to say the least. The latest government waste strategy, dating to 2010, makes no mention of it as even a possible option. 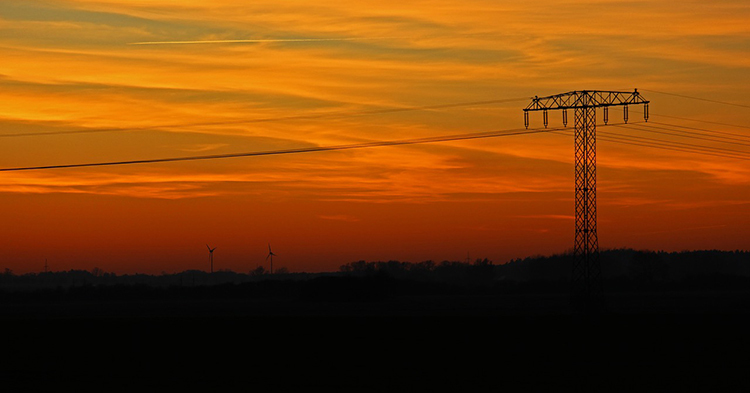 Aside from the environmental position, many of the drivers which would promote WtE do not really exist in New Zealand. The country has plenty of space, with only a small overall population and no major cities, by international standards, aside from Auckland. It’s not clear that other major towns, such as Christchurch or even the capital, Wellington, have the level of waste generation needed to sustain a commercial WtE enterprise. The Huntly proposal would, on the face of it, need to be fed with waste from across much of New Zealand or even further afield in order to be viable. It is not the only WtE plant mooted in New Zealand, however. 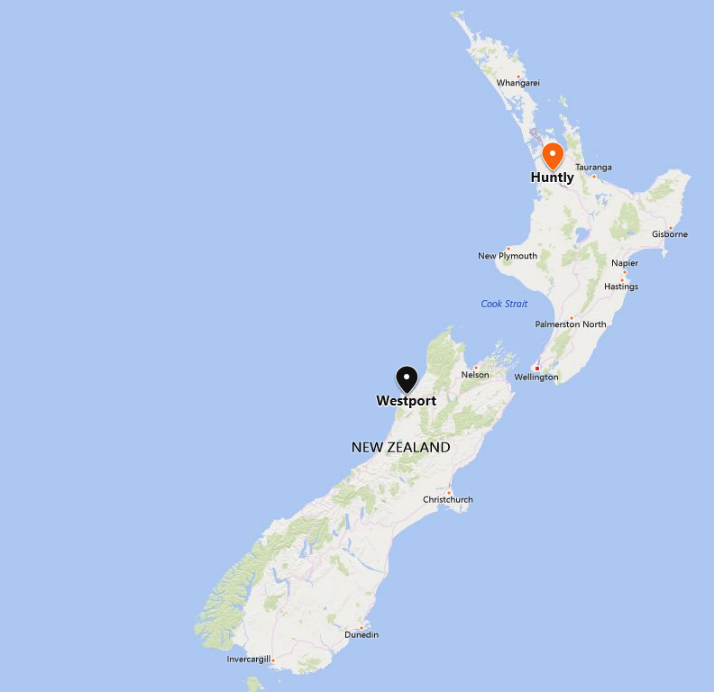 The town of Westport on the South Island has been looking using a disused cement works site for a WtE plant (possibly involving pyrolysis) since at least 2016. In May 2018, the developer (Renew Energy Ltd) announced a NZ$300 million deal with China Tianying to build the plant. Also on the South Island, there are tentative plans to build a specialised pyrolysis plant at Blenheim, to deal with waste from the region’s many vineyards. At present, none of these plans look like coming to fruition. There’s no obvious public sector enthusiasm, and environmental concerns – justified or not – make them politically difficult. Finally, it’s simply not clear that New Zealand generates the levels of waste to make such investments viable. There is pressure for change, however, even if it’s simply driven by residents looking at waste that used to be shipped to China and wondering what to do with it. That’s not to say there’s no activity, but successful projects are more likely to be small-scale and focussed in approach. For example, in August 2017, a new PET plastic recycling plant was opened in Lower Hutt, near Wellington. This has attracted public funding from the government’s Waste Minimisation Fund. The plant was upgraded in 2019 and can now handle 6,000 tonnes of PET bottles per year. WasteView Projects provides your business with unparalleled access to ‘real-time’ business opportunities in the Waste, Bioenergy & Recycling sectors. Projects in our industry-leading database are added and updated daily by our team of expert global researchers. E.g. Anaerobic Digestion in the UK. 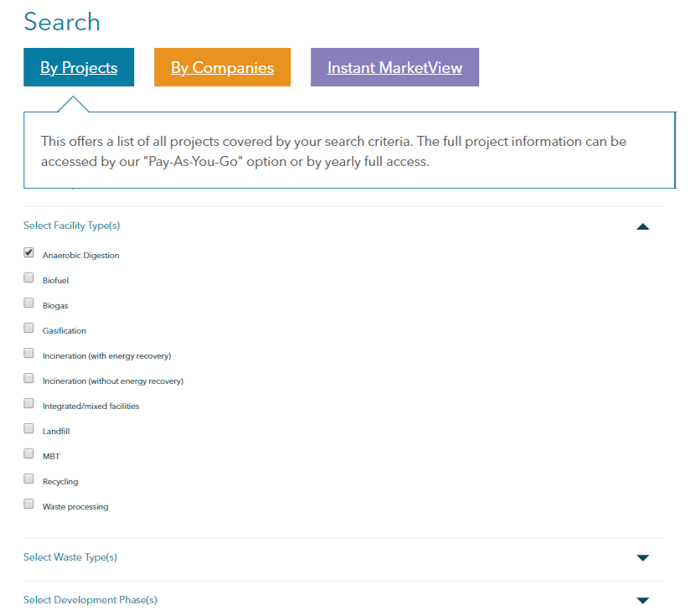 Next, you’ll be presented with a list of projects that match your search criteria and you can toggle between our ‘By Projects’ and ‘Instant MarketView’ functions. Instant MarketView provides you with an instant visual snapshot using your defined search and creates a report, complete with graphs and statistics, that can be downloaded for use in business plans, strategy documents or for sales and marketing. Saved Searches to keep track of particular locations or project types you’re targeting. When a Saved Search is accessed, it is re-run as if for the first time to give you the latest projects/updates. 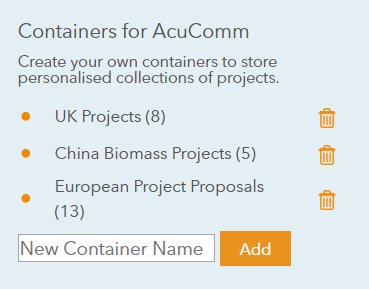 Containers to store your personalised collections of projects. 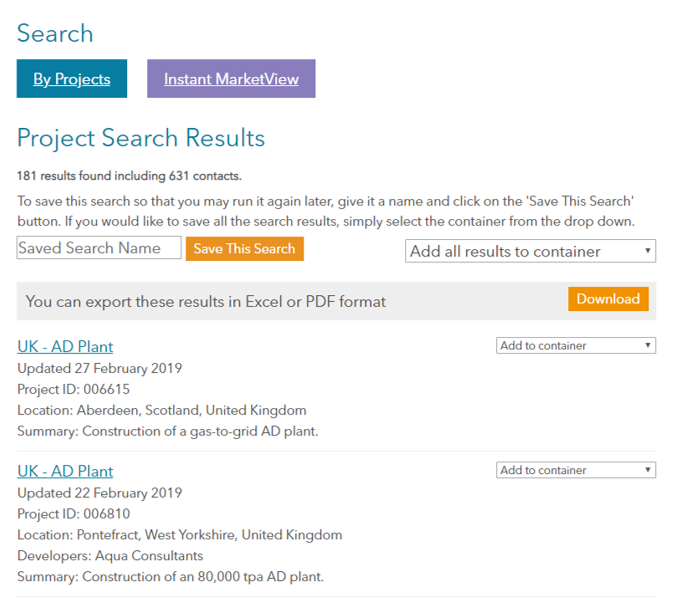 Your search results can also be exported and downloaded as Excel or PDF files. 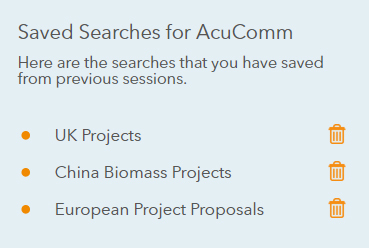 With WasteView Projects, you get full access to the AcuComm database. This includes access to 6,800+ projects and the contact details of over 20,000 decision-makers that are associated with them. Your subscription gives you unlimited downloads, the ability to search by company and an easy export functionality to populate your CRM. Get started by identifying your new business opportunities in less than a minute. If you’d like any more information about WasteView Projects or any other of AcuComm’s products, get in touch with the team today on 01243 788686. 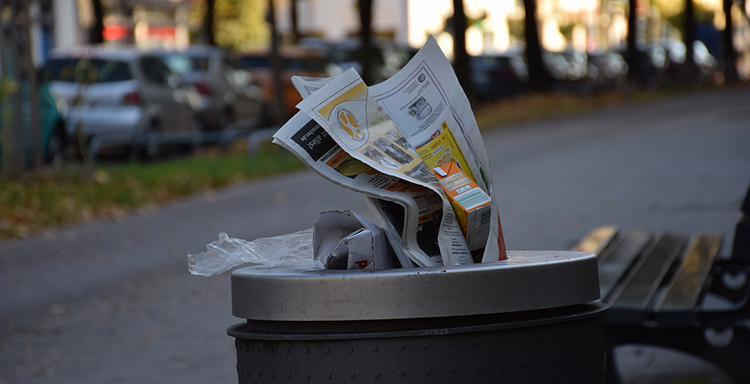 Interserve plc’s slide into administration last week has been blamed largely on the company’s involvement in the waste-to-energy (WtE) sector. On the face of it, this development will do little to inspire confidence in the future for the UK’s waste sector infrastructure projects but coming so soon after the liquidation of Interserve’s rival outsourcer Carillion, it begs the question whether the collapse stems from exposure to the WtE industry or is more a consequence of internal corporate failings. Earlier, in May 2016, Ringrose had said the cost of exiting the WtE sector would be £70 million. More recent estimates put this figure at £227 million. This morning’s breaking news is that over the weekend, a ‘pre-pack’ insolvency arrangement was put in place, administrators EY were installed and Interserve plc’s assets were immediately moved to Montana 1 Limited, a group controlled by Interserve plc’s lenders. This move means that the company will continue to operate, out of insolvency, with Montana 1 trading as Interserve Group Limited. Where this leaves the development of the much-delayed £145 million Derby and Derbyshire Waste Treatment Centre, which was being developed by a joint venture between Interserve and Renewi, is uncertain. Operations were expected to start by the end of 2018 and while that did not materialise, Renewi and its clients, Derby City Council and Derbyshire County Council, have not given any indication that project completion will not be achieved at some stage soon. US$4,294 million worth of projects were covered by our researchers last week, including 19 new additions and 29 updates. Biomass investment in Brazil, 2018-19 – including coverage of 5 projects in 2019 alone. MBT plants planned or under construction – including 3 projects covered this month, each worth over US$30 million. Planned wood-fired biomass plants in Europe – including a new CHP cogeneration plant at a facility in France.